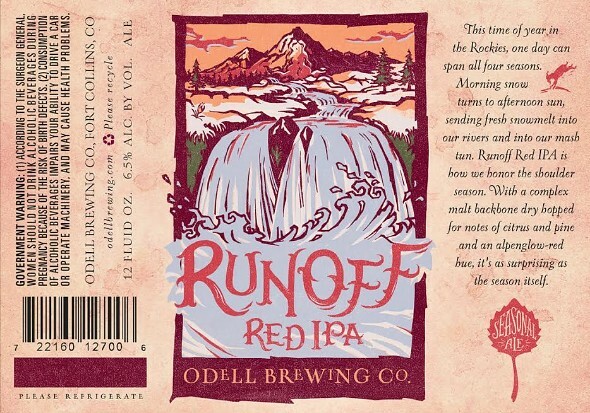 If you loved Odell Brewing’s Red Ale, it is unfortunately going away … but never fear as it is coming back rebranded as Odell Brewing Runoff Red IPA as part of Odell’s seasonal series of beer. The name “Runoff” pays tribute to the snow melt and subsequent runoff in late spring that provides the very water of which Odell brews their beer with. Odell Brewing will celebrate the release of Runoff in the brewery’s Tap Room on January 4th and 5th. Guests can enjoy samples of the beer, special food truck fare, as well as live music by the Waido Experience on Sunday from 3:30 – 5:30 pm. Runoff Red IPA will be available in six packs and in the Winter-Spring Montage variety pack throughout the brewery’s ten state distributor footprint.